Mid-Atlantic Tire Pros Collects over 442 Koats for Kids! Mid-Atlantic TirePros in Easton recently sponsored its 12th Annual Arlene M. John Koats for Kids Drive, collecting over 442 coats for underprivileged children on the Mid Shore. Partners in this year’s event include Kohl’s, WCEI/WINX, the Star Democrat, Crackerjacks, Ship and Print, Admiral Cleaners in Easton, the Continental, and SpiderWeb Connections. 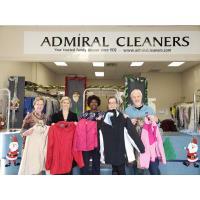 Admiral Cleaners provided complimentary coat cleaning. The drive began in 2007 in honor of Terry’s wife Arlene. Pictured left to right are Linda Laramy of Crackerjacks, Whitney Kerridge of Admiral Cleaners, Marilyn Neal of the Neighborhood Service Center, and Patti Tibbitt of WCEI/WINX and Terry John, owner of Mid-Atlantic TirePros.